You may have heard of Bulletproof Coffee. It even has its own listing on Wikipedia: Bulletproof Coffee! It’s a brand created by the man who blogs at Bulletproof Exec, who adds a proprietary “brain octane” medium-chain triglyceride oil to it. The term is also used generically to refer to high-quality coffee blended with high-quality butter or ghee. The inspiration is butter tea, a traditional energy-giving drink in the Himalayan region that uses black tea, yak butter, hot water, and salt (using those pink Himalayan salt crystals, methinks). I realized a few years ago that – after drinking coffee for my whole adult life – that I didn’t even enjoy the taste, always doctoring it with cream and sugar (waaaaay back before I went dairy- and sugar-free). I started drinking it for the stimulation of the caffeine when I was a young college student, and it became a habit. Even freshly ground, organic coffee beans just didn’t and still don’t taste good to me. Too acidic and too much caffeine. Smells good, though. Then I discovered green tea. I enjoy the taste, the lower level of caffeine, the health benefits, and the way my stomach feels. So it was natural to experiment and come up with my own version of “bulletproof tea”. 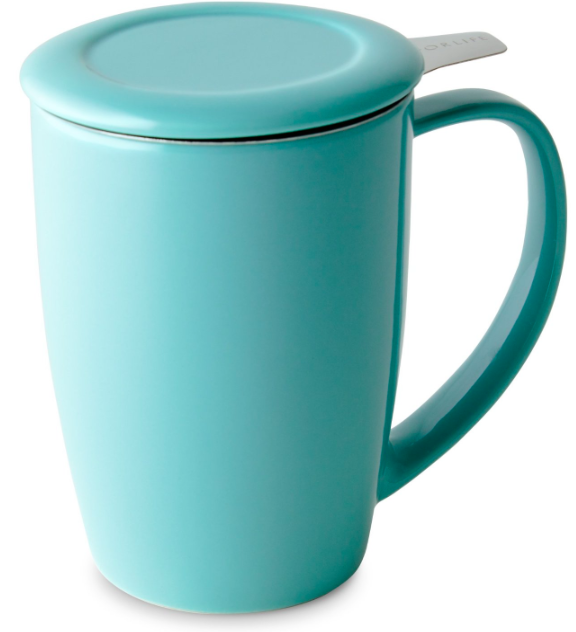 Have a mug with lid and a built-in infuser ready (or mug plus strainer, whatever you’ve got). These days I’m doing Functional Movement System training 5 days a week and doing 15-20 hours of massage per week. Just had my 62nd birthday, and I’m feeling pretty darn good! Illness, including even seasonal allergies, seems to be avoiding me. A small handful of berries. I used blueberries today. They contribute to brain health. Another fruit or combination, like apple, banana, or pineapple. I find green drinks most palatable when just mildly sweet. Avocado is good, too. Greens. I add a big handful of power greens (chard, kale, mizuna, and arugula), enough to cover a dinner plate well. They add vitamins and minerals and fiber and other healthy benefits. A chunk of ginger root the size of the end of my thumb, for digestive health. Same size chunk of turmeric root, an anti-inflammatory. A bit of raw, unfiltered apple cider vinegar, up to a tablespoon, for alkalinity, nutrients, and to keep candida levels down (if I haven’t already drunk it in a glass of water). 3 tablespoons of coconut oil for energy. 12-14 ounces of filtered water.